In August, the pro-Gary Johnson PAC Balanced Rebellion released an ad on Facebook and YouTube that clocked in at upwards of five minutes. The main character is “Dead Abe Lincoln,” played by a twenty-something kid dressed in a top hat and overcoat, with what looks like some dead animal’s hair glued on to his cheeks. The pro-Johnson ad capitalizes on the unusually high number of dissatisfied voters in this election cycle, highlighting the pressure to choose between two unappealing candidates. Lincoln points out another option: Libertarian Johnson (or, as Lincoln later refers to him, “freakin’ Batman”). Because Johnson has had little success swaying any of the major parties’ voters, he uses Lincoln to introduce the Balanced Rebellion. It’s a program that matches disillusioned Republicans with their disgruntled Democratic counterparts. The idea is that if both of them vote for Johnson, neither is “giving their vote” to the opposition’s candidate. Using actors to play candidates is not uncommon. But the Balanced Rebellion’s use of this top hat-wearing, insult-slinging former president is not the norm. For starters, none of the commercials in the Duke Ad Watch database that contain “candidates” exceed 30 seconds — less than a tenth of the Johnson ad’s length. There are several more key differences, which I’ll illustrate using a few ads. All the “candidate” ads attack at least one politician. But unlike the Johnson commercial, actors usually play the real-life candidate under fire. Using that technique, the producer has more leeway to criticize their opponent. Plus, the attacked politician can’t immediately respond or contradict any claims made. In “Town Hall” from End Citizens United, we watch from behind Senator “Kelly Ayotte” (R-N.H.) as she fields questions from dissatisfied constituents. After each constituent raises a concern — about Medicare, big oil — special interest groups signal to her how to respond. As a result, the real Ayotte appears to be a puppet representing donors’ concerns and not her own district’s. Perhaps because of the ads’ tendency to attack, we never see the actors’ faces. In Senate Majority PAC “Koch Call” commercial featuring Senator “Joe Heck” (R-NV), we barely even see that much — just the corner of Heck’s trademark rectangular glasses as he answers a call from the Koch brothers. Instead, “candidate” ads shoot from over the actor’s shoulder, behind them or from too far a distance to make out their features. 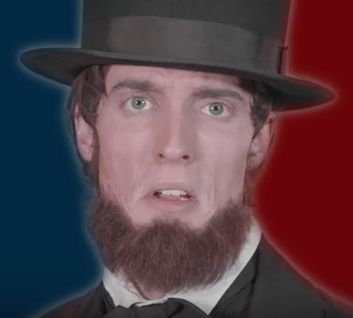 That’s a stark contrast to the five-plus minutes we spend staring into Dead Abe Lincoln’s dead blue eyes in the Balanced Rebellion spot. In the Johnson ad, Lincoln is the focus. 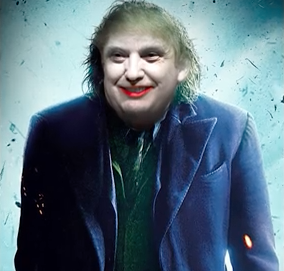 He explains the video’s message in full, often aided by headlines and graphics (like this one of Trump as the Joker from “Batman”). However, actors usually take more of a backseat role: they’re props, not the ones making the commercial’s point. Take “Hypocrite Hillary Leaves You Defenseless” from the N.R.A. In it, we follow “Clinton” as she exits a government SUV, walks past guards with big guns and boards a cushy private jet. The combination of a narrator, sound bites from the real Clinton and the dark tone of the video make the argument against Clinton’s “hypocritical” stance on guns. It’s apparent that Johnson’s ad follows none of the common practices seen in other groups’ advertising. And it might not be an arbitrary difference: The “candidate” ads containing those trends come from organizations affiliated with the major parties. It looks like we can add advertising strategy to the list of things that make the Libertarian an outsider in this election.